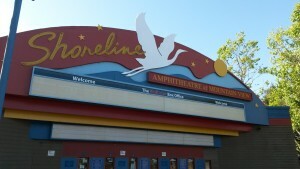 We provide shuttle to and from San Antonio Caltrain station for concerts at Shoreline Amphitheatre. After the concert, the shuttle will drop off at Peninsula Caltrain stations and San Francisco. Every rider on our long distance post-event trips will receive a free bottled water. 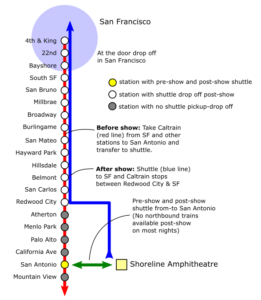 When coming from San Francisco, take Caltrain and transfer to shuttle to Shoreline Amphitheatre. See the table below for shuttle times. Shuttle times vary according to event dates so please check this page a week from the event. For selected weekday and weekend shows, we run shuttle from San Antonio Station (green line on map) direct to Shoreline Amphitheatre. Many weekday trains do not stop at San Antonio so check the train schedule (click here) for trains that stop at San Antonio. For pre-paid riders, your receipt from Paypal is your ticket and you may print it out or display it on your phone to the driver. Shuttle will wait for late trains. For some weekday shows, due to commute traffic congestion, we will have limited or no service to the Amphitheatre from San Antonio. There are free commuter shuttles and VTA bus routes that can take you from Mountain View or San Antonio to the Shoreline area. Due to traffic, we do not pick up inside the Amphitheatre once the show is over. We pick up at a location about a 10 minute walk away at 1875 North Shoreline Blvd, Mountain View and will wait up to 30 minutes after the show ends before we leave for SF. Click here, read and print out this map for direction to shuttle boarding location after the show. Use the links below with your phone for GPS directions to the shuttle boarding location at the end of the show. It is dark out there and very easy to get lost. Our shuttle boarding location does not change and stays the same for all concerts. If you are purchasing ticket for another rider, please make sure the other rider knows where to board the shuttle at the end of the show before heading to Shoreline. 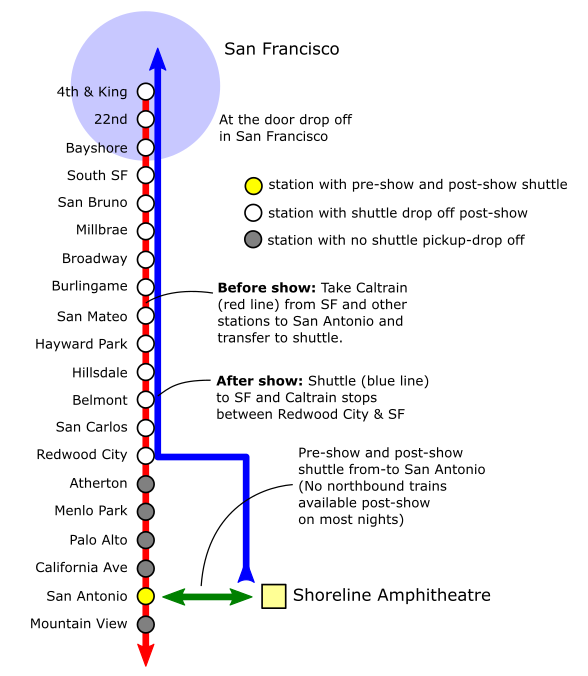 For some shows (all day music festivals) we will run shuttle back to the Caltrain station before the show ends. We make reservations available for shows that start within 5-6 days. If you don’t see your show, please come back later. We do not serve the show/fireworks on July 4th. Please see this page for fare schedule and other information. After the fare is paid, your Paypal receipt is your ticket to ride. We do not send anything else. Please be prepared to show your Paypal receipt (print out or on phone) to driver when requested. If your selection is not available, that means the seats for that trip for that day are no longer available. Standbys spaces may be available for the same trip but must be paid by cash at the time of the ride. No refund for any purchases by group of 4 or more unless it is 36 hours before the start of event.